Over time driving over speed bumps, potholes or kerb can knock your wheel alignment out. By not having this checked out, this can lead to uneven wear on your tyres. In most cases you will feel you car pulling to either the right or the left side. Depending on the extent of how bad it is, it can lead to an increase in fuel consumption, and your tyres can wear down at lot sooner than normal. Are you facing the above conditions while driving? Here at Walthamstow Village Garage we have one of the lowest priced wheel alignment prices around. 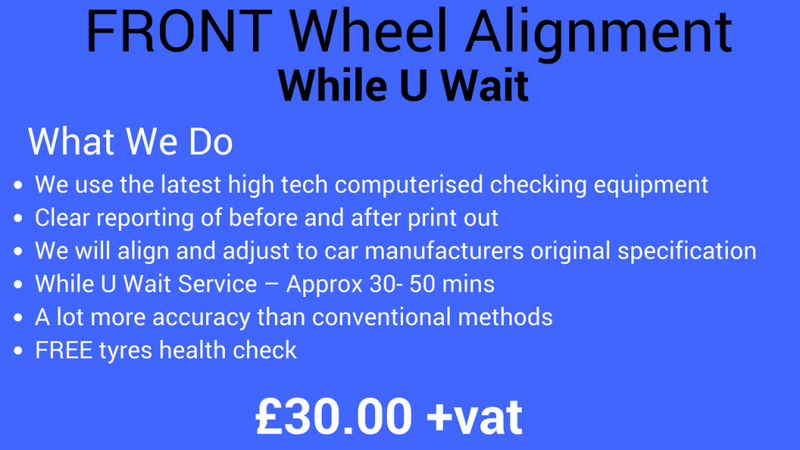 Our price for front wheel axle alignment is only £30.00 +vat. Most standard cars only need front wheel alignment only, but on some modern and particular makes and model such as BMW, Audi, Landrover we can also align the rear axles also. 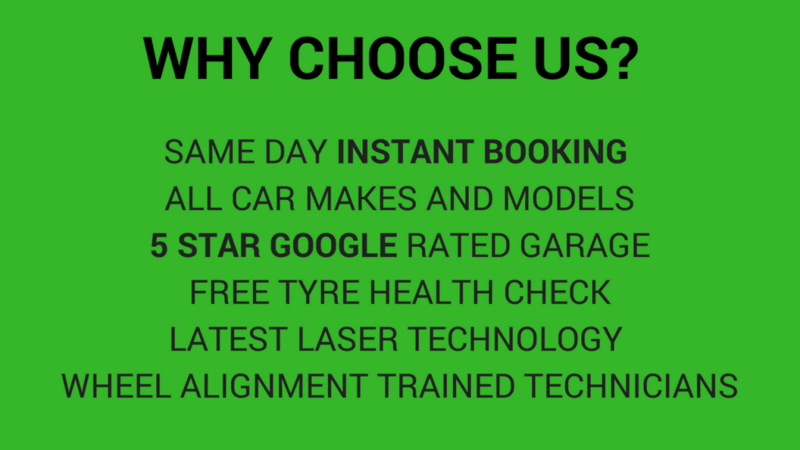 We use the latest computerised technology to bring your wheel alignment as per your car manufactuers guidlines. Correct wheel alignment also ensures that the tyres are perpendicular to the ground and parallel to each other. It also means that on a straight road you car will travel in a striaght line. 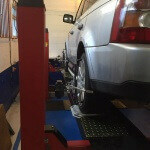 By carrying out Wheel Alignment also known as tracking it can help with even tyre wear, and making sure that you get the longest use of your tyres. Safety aspects wise its also essential to get your wheels properly aligned as you will feel more in control,better road handling and a smoother ride. 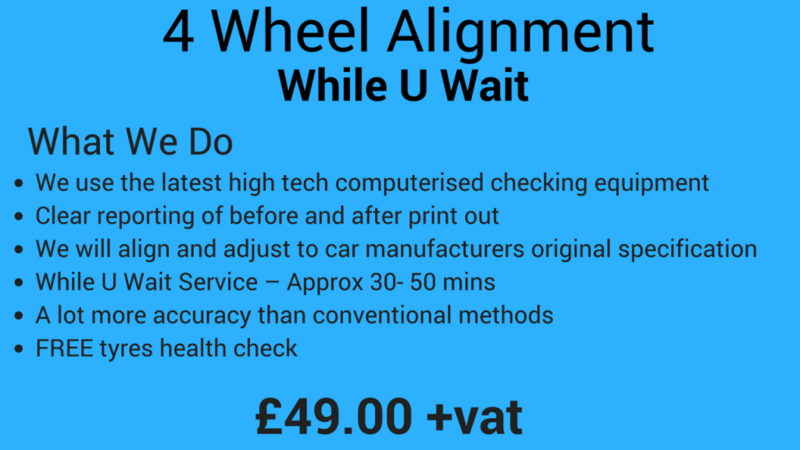 When we carry out the wheel alignment, we print out a before and after report showing you the outcome and difference when the tracking has been corrected. 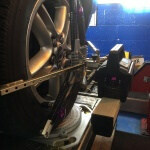 We will also carry out a FREE tyres health and safety check during the wheel alignment. For 4×4 and specialist vehicles costs may very. Please give us a call to get an exact quote.